Chocked full of methods, procedures and examples richly illustrated with over 800 detailed full color photographs. The first section discusses the tools and materials, The second section discusses the 12 most common design elements to consider, The third section walks through the creation process for the world's 17 most effective top water patterns in a step-by-step manner. Over 50 Tips & How-To's and DIY Projects are included. 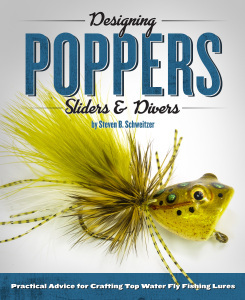 Innovative and creative techniques to make highly effective top water lures for fly fishing in freshwater or salt. Hardcover, 8.5x11 inches, 304 pgs.